MONACO HOTEL with 12 floors/53 rooms, 3 star luxury standards, incredibly beautiful location - located on the shaft of My Khe Beach dduwonwgf (1 in 6 beach prestigious American magazine - Forbes most beautiful). You made 250m walk to the beach is No.1 all the planned city, serving tomato demands thorough tour, beach, resort ..
With the advantages of infrastructure, geographic locations and people served. 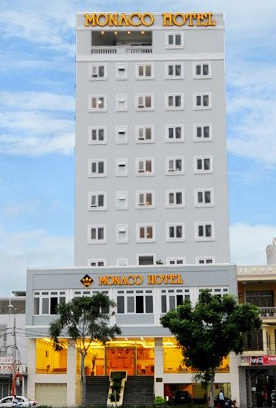 Monaco Hotel Danang hope is ideal for travel - rest of you. Wishing you a wonderful holiday - Safety - Health! Description: Deluxe Room with 7 rooms, designed plush and cozy. The rates include 10% VAT, 5% service charge. Window 2 sea view and mountain view. Free breakfast served in the 2nd floor. At the restaurant you enjoy as unparalleled elegant gourmet dining prepared by a highly trained staff. Guests can enjoy daily buffet breakfast and a variety of Asian and Western delicious dishes.